Are you a fan of juicing? Friggies, a new social enterprise from the countryside, is now ready to offer juicing with a new twist as the juicing craze continuous on in the metro. After months of testing out its products at the “Bahay-Kubo” booth at the GK-Enchanted Farm in AngatBulacan, and joining a series of food bazaars including a trial weekend market, Friggies is now inching its way into the mainstream market with the official launching of its website and roll-out of delivery service in Metro Manila area this month of September. 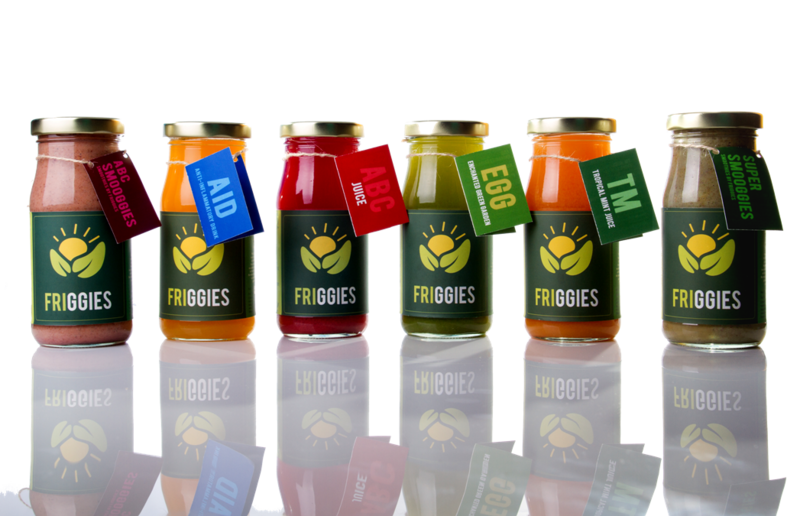 Friggies, which came from the words FRuIts and veGGIES, will be the emerging juice company among the pool of social enterprises such as Human Nature, Theo and Philo, Bayani Brew, Golden Egg, Plush and Play, First Harvest and Gourmet Keso to name a few. They support communities by sourcing their raw materials from GK-Enchanted Farm and cooperatives from around Bulacan, as well as other local farms in the country. Though still being in incubation stage, Friggies has been duly incorporated last June 19, which signifies that it’s about to make a name for itself. The company draws inspiration from its founder, Frederick Espiritu, who sees Friggies as the culmination of his own personal journey of healing. He became a strong advocate of natural health after recovering from Hyperthyroidism that he had for more than 5 years. Since then, he has always been passionate of sharing this experience to inspire and help people deal with their health challenges. But it was after losing his father to cancer that became the biggest turning point in his life, and eventually paved the way to Friggies. “I made a vow to myself that I’d do anything so that no other son would bear the same pain of losing his father to cancer,” said Fred whenever asked about the story behind Friggies. On a lighter note, it actually came as a joke to Joey Lee, a close colleague and fellow natural health advocate, when Fred approached him one night at the office and asked if he’d be willing to start their own company. “Fred told me that we will build a company that’s going to be bigger than the biggest coffee company in the world. And I was laughing while asking how we’re going to do that,” Joey happily recalled. A month later, Fred also called in Lisamari Policarpio, another previous colleague of them to join and complete the team. “After leaving my job, I was looking for a business opportunity to support my family while being handson raising my daughter,” Lisa shared on what convinced her to join. “And Fred used to bring juices in the office and shared them among us. So when he said we’ll be making those juices for our products, I knew it has potential,” She added. Previously Telecom Engineers, the trio is the unlikely team to put up the juice company Friggies. They presented the idea to GawadKalinga in one CSI night sometime November 2013, a regular gathering of social entrepreneurs at EF-Café. The proposal was approved and on December of that same year, Friggies had its selling debut during the Countryside Christmas Fair. It was a humbling kick-off experience, since Friggies was able to contribute a significant share on the proceeds for the Yolanda relief efforts. They were also delighted by the reception of the people who tried and bought the ABC Juice, which was the prime and only product back then. Today, Friggies has four variants of cold-pressed juices to offer. After the ABC Juice, the company now focuses on coming up with juices made only from locally-sourced and organic produce. It’s interesting to note that each juice variant has a character. For one, the TM Juice was named after the founder of GawadKalinga, Tony Meloto. The AID Juice, is a functional drink that was specifically mixed to combat inflammation, hence the name Anti-Inflammatory Drink. Their version of the green juice is quite special, because consumers get to choose the green veggies that will be mixed in the juice. Friggies aims to educate and raise awareness among its consumers the value of taking care of one’s own health. So they came up with the idea of juicing together through a fun and learning experience. Friggies also introduced another product line Smooggies, which means ‘Smoothies by Friggies’ and it’s what they recommend to people opting for a meal replacement. This is what sets Friggies apart from their counterparts that plainly offer juices for detoxing, fasting or cleansing. Instead of having 1-day, 3-day or 5-day cleanse, Friggies juices and smoothies are to be incorporated gradually into a regular dietary regimen until we are able to stick to a healthy-habit that eventually becomes a lifestyle. “Healing is a journey. Juicing is a lifestyle,” as Friggies tagline would suggest. “Our body heals through detoxing and cleansing. The purpose of the juices and smoothies is to help our body do them. Healing does not happen occasionally and optimum health is not something you can only have for a day or a week. It’s our innate gift, we are constantly healing and health is a way of living,” explained Fred on his personal views. “Juicing is supposed to be an amazing experience, and it doesn’t necessarily mean you should not eat anything for days to benefit from it. We are trying to take care of our body, not impose some kind of punishment by starving ourselves. Healing takes place when our body feels that it is loved. This is what we hope people get from Friggies, to feel that they are loved,” Fred added with a smile. Their website, www.friggies.com will be launched this September 6 and celebrated as they join “Belly-Sima”, the first ever artisan and gourmet food fair happening at Glorietta Activity Center in Makati, where free taste of Friggies juices and smoothies will be given. Friggies Online Store is one the main pages of the website, where consumers can easily place their orders and securely process payments. They have key partners to cater the delivery of the juices and smoothies right at your doorstep or wherever you’d prefer, all throughout the week. Another major site feature is its blog section, where everyone is invited to share a story, be it a juicing experience, a vacation trip one recently had, or the things we are passionate about. Truly, there’s a lot more to Friggies than what meets our taste buds. It’s as if we’re just having a taste test of what it has to offer. And the best is yet to come.